Today marks the anniversary of a momentous milestone in the marriage equality movement. One year ago today, on Election Day 2012, voters in Maine, Maryland and Washington went to the polls and voted in favor of the freedom to marry for their gay and lesbian family, friends and neighbors, marking the first time marriage equality had been legalized via the ballot. That same day, voters in Minnesota voted down Amendment 1, an amendment to the state’s constitution that would have defined marriage as being a union solely between a man and a woman. The state became the first in the country to vote against such an amendment on the ballot. 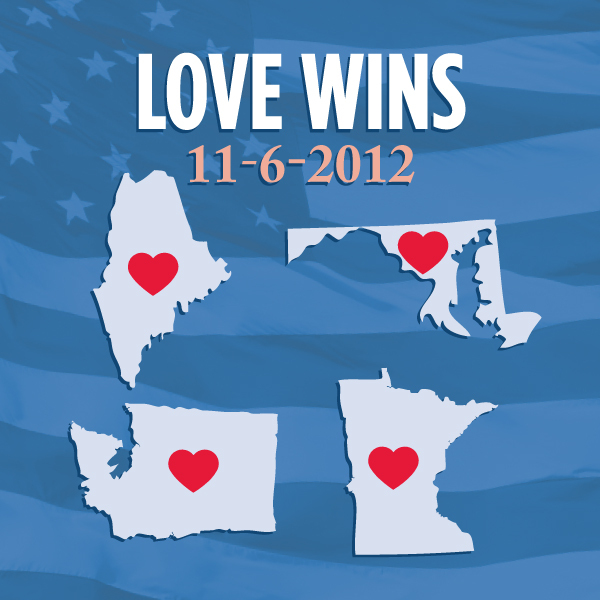 The clean sweep broke a 32-state streak, dating back to 1998, in which marriage equality had been vetoed by voters. But more importantly, these victories marked a historic turning point in the quest for marriage equality, and are representative of American’s shifting attitudes around the freedom of to marry for gay and lesbian couples. Since that historic day, 6 states—Rhode Island, Delaware, Minnesota, California, New Jersey and Illinois—have also opened their doors to marriage equality. The momentum is on our side. We are on the cusp of seeing the list of 15 states with marriage equality grow further.